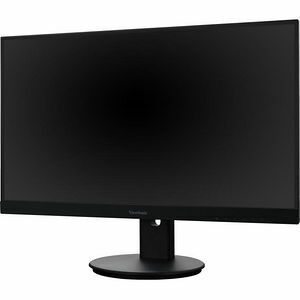 The ViewSonic® VG2765 is a 27" WQHD monitor that delivers stunning definition, robust ergonomics, and future-proof connectivity for the ultimate work environment. Featuring a premium panel with 2560 x 1440 quad HD resolution, this monitor delivers wide-angle viewing and incredibly vivid colors with 77% more pixels than standard Full HD monitors. A 3-sided thin-bezel design provides a nearly seamless viewing experience in multi-monitor setups. Future-proof connectivity options include DisplayPort, Mini DisplayPort, HDMI, and dual-USB hub for utmost compatibility with laptops, tablets and other computing devices. For maximum comfort and a customized fit, a robust fully ergonomic stand provides tilt, pivot, swivel, and height-adjustable options. In addition, VDI client endpoints can be easily attached to the integrated client mount, saving desktop space and minimizing cable clutter without interfering with ergonomic functionality. With amazing visuals, incredible versatility, and customized comfort, this monitor delivers a complete enterprise solution on the desktop. DisplayPort, Mini DisplayPort, HDMI inputs, and high-speed USB ports give you the freedom and flexibility to connect to a variety of devices. The ergonomic stand also features a built-in client mount for quick installation of VDI client endpoints on the back of the monitor. This allows for simple VDI deployment and a streamlined desktop without interfering with the ergonomic functionality of the monitor.